Francis Roig: "I think Nadal will fight for all the titles Federer has earned in his 33 years"
Francis Roig is one of the few men Rafael Nadal trusts. Along with Toni, his uncle and tennis coach, Roig has been collaborative in the development and progression of Rafa over the last ten years, the most glorious career of any Balearic player. One day before Nadal debuts in the Conde Godo 2015 , Roig talked with Point Break in the Real Club de Tenis Barcelona. How and when did the opportunity to train Nadal come about? 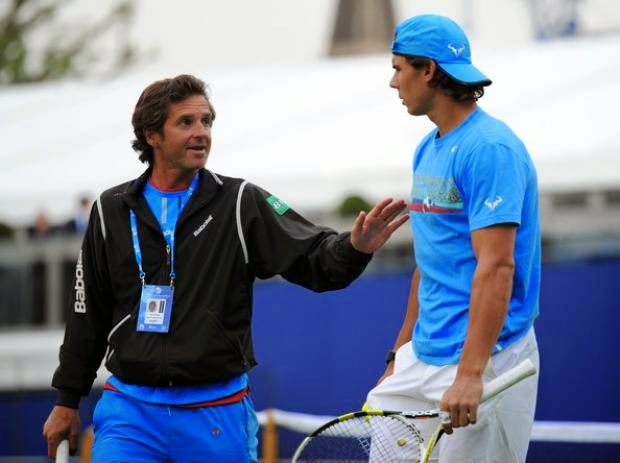 In 2005 in Australia, I coached Albert Costa and Toni suggested the possibility of traveling with Rafa for several weeks. I said yes, and then started with the South American tour... until today. How do you and Toni Nadal switch up the tournaments you are traveling to? I travel to about 12 tournaments a year: Abu Dhabi, Doha, Indian Wells... in the past I also went to Miami, but now Toni goes. It's a change we've made. Here it's the two of us, but this is not traveling. Then I'll go a week before Wimbledon, Canada and Cincinnati, and then the Asian tour. I do not travel to the Grand Slams. When traveling with Rafa and Toni stays in Spain, does he give instructions on what to do? Or do your have autonomy? Toni always gives me all the autonomy I want. At the same time, there are things we talk about. Sometimes, if something is not going right, we discuss it. Is your view on Tennis and Rafa the same as Toni's, or are there differences? Ultimately, the goal is always the same: try to get Rafa to play a little more aggressive, within reason. That is always our intention, and it has evolved. Rafa is aware of this, but you must take your time and can not break the base of a player. We know he can play more aggressively, but we don't want to go crazy. Well, it's a racket with more separation between the strings which allows for more spin, the ball goes faster with less effort. I do not think it will give much more spin than before. Was this change needed to do more damage to rivals given the latest results? I don't think the reason for changing the racket was because things have not been going well. His tennis has not been all bad. In Indian Wells he played pretty well. In Miami he was a little looser, had a difficult day and was more nervous than usual. The lack of confidence has made him play more nervous and he is not as fast on his legs. In this life you always have to improve, evolve. He wanted to test it now and move forward. Why is this one better than the previous racket? I cannot say it better or worse. What happens is that he misses more. It has the same string, but more separate, especially on the sides. Then when you hit well and not in the middle, the ball just keeps spinning. I think 80 percent of the change of racket is to spin the ball more with less effort. If you change your racket to make the ball spin more, you'd better stick with it. At first there is always a bit of an adjustment, trial and error. And an error is a good sign because the ball overspins. Will he keep the new racket until the end of the clay court season or indefinitely? It is the racket with which he will play for now and he has not made future plans about it. Has the 'smart racket' provided any data that surprised you and have you made any change based on the data? No, the truth is that I have not been aware of this. I know that there is data, but as of today I have not seen the information. Rafa has acknowledged in recent weeks that he has anxiety and lacks confidence. Have you and Toni worked on the psychological aspect? Have you had a talk with him to help him improve in this area? To tell you the truth, he has certainly had anxiety and has played more nervous, but gradually he will slowly overcome this and we must not give it too much importance. Now on clay he has more time and leeway, and that will help him gain control over those moments when he feels overwhelmed. The regained confidence will serve him well in Roland Garros. If he will not improve in that regard, have you considered the possibility of receiving help from a sports psychologist? No, it's possibility that has not been discussed. We think he will overcome it. Yes, it has always been that way not just now. I remember when he won at the Olympic Games in Beijing, the first day we trained he told us after five minutes, "I just can not play here." There was tremendous humidity. He had to change his racket every three minutes because it had soaked his hand, and he accelerates so much that if you don't have a good grip on racket and you move, you lose a lot of precision and sensitivity, you think that the ball will escape. In damp places that a little more of a problem than in others. Do you worry a bit when it's a very humid day? No, we must accept it (smiles). It has always been speculated that Nadal would have a short career because of the injuries he suffered. What do you think about longevity? It has been a subject of speculation from the third year that Rafa was top. It's been 11 years and he is still on top. I think I can not call it a short career, because there have been between the first three or four... I do not know, but I bet that there have not been more than five players in history to have done so. It is a little bit more complicated now, but I think he will succeed and will return to fight for the Grand Slams. Can Nadal fight for every title that Federer has earned in his 33 years? Following the discussion Rafa had with Carlos Bernardes in Rio de Janeiro, has he moved on or is he still angry? I have not spoken to him about this issue because I was not in Rio, but in Buenos Aires. Maybe in that moment he thought it was uncalled for to get a time violation, but there are certainly no hard feelings.